Can someone tell me why my tile is drawing weird pixels? which my code is just creating a blank Texture2D.. I actually am believe it or not. Ah sorry, I didn't read your first post right. You are creating a Texture2D with just one color (green?) and getting additional different colors (orange?) when drawing this texture? It seems that you are using MonoGame with WindowsForms. Please test your code in a new MonoGame project first and see if you are getting the same result. You should draw this texture unscaled of course. Just make a screenshot and zoom it with an image editing program. Just a heads up not related to your issue here. The way you use GetData and SetData is extremely inefficient. 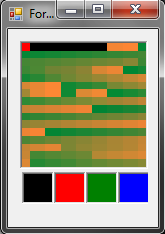 If I were you I'd have a color array that mirrors the texture data so you never have to call GetData and when setting data use the overload that lets you specify a region so you can only update the changed pixel. hi guys the problem was that I wasn't setting the backcolor of the texture when creating it. @sqrMin1 I don't know what was causing the problem but I guess the texture wasn't being created with transparency. I am using monogame.forms to draw it. I am drawing it scaled to the size of the control. I am only using setData and getData for setting pixels when clicking on the monogame control. the size of the texture is 16x16.